Name - Required. What you wish to call the Element. Description - Optional. A brief description for the Element. Image - Required. If you do not specify an image, a default gray box with the Element name will be created for you. Images are used as the sources for dragging and dropping Elements into your Layouts. Category - Required. Which category to place this Element under. Rank - Optional. The order you wish this Element to show in its category. Markup - Optional. 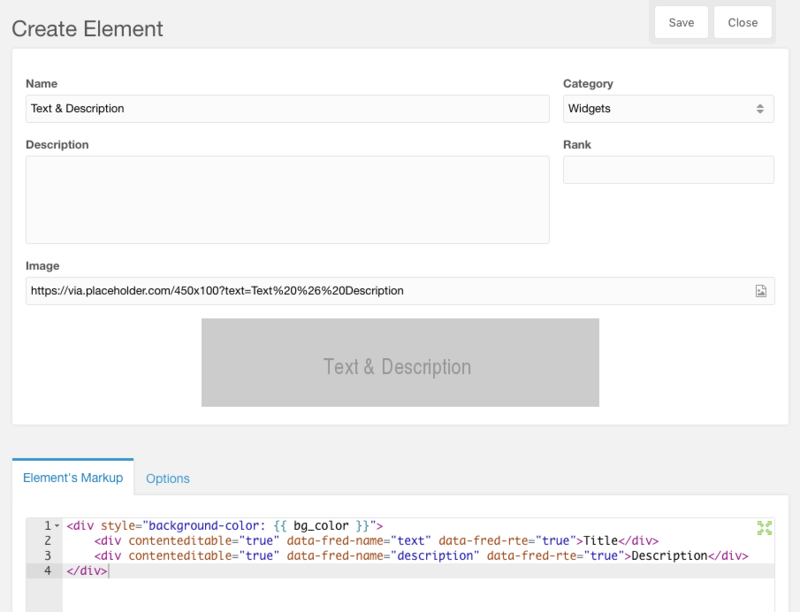 HTML + Twig markup for the Element, including Fred-specific attributes which allow you to control things like save targets, visibility when creating or viewing content, etc. after an Element is used, and if you have the "Take Screenshots" permission, clicking the camera icon above the Element when focused. Note: the library used to take screenshots is very good, but it doesn’t understand some CSS properties and may not render the screenshots optimially for your use case. For best results make sure that manual Element screenshots are 500px wide. Elements are like master templates which can be updated at any time. When an Element’s markup or option set is updated, all places in a site should update to reflect these changes. To see the updated results, either resave the page, or use the "Rebuild" tab in the Fred 3PC.